The Better Sleep Council has coined the month of May as ‘Better Sleep Month’. Seeing that sleep is widely important for an improved quality of life, the Better Sleep Council has invested decades into its research and initiatives to educate and spread awareness to improve sleep quality internationally. The BSC’s mission is to educate people on the link between sleep and health, including the role of our sleep environments. If you have ever Googled a bedtime discomfort or even a dream, you’ll be sure to find endless articles that tell you the consequences of sleeping poorly or not enough. What we do hear far less about are the simple steps that can present big positive changes. It’s no longer a secret that a lack of sleep can have countless impacts on your physical, emotional and mental wellbeing. But how can we proactively improve our sleep? A full stomach keeps your body working when it should be sleeping. Don’t eat or drink too much right before bedtime. Cutting out food (especially the wrong kind of food) in the hours immediately before you go to bed is pretty simple to do, with a bit of discipline. This small change can lead to big gains. Although alcohol makes us drowsy and may help you fall asleep, once its ingredients wear off it can actually shorten your nights, leaving you wide awake earlier than usual. As cliché as this may sound, creating a bedtime routine will pay back major dividends between the sheets. Parenting and psychology experts rave about this fact for children, although the same applies to any age group. It is inherently human to thrive from familiar and consistent routines. If you make bedtime habitual, you’ll have more control of your sleep/wake cycles than you would have ever imagined possible. In that last hour before you turn in for the night, find a patterned routine that promotes rest and the onset of sleep. Consider things like reading or bathing – anything that uniquely helps to shut off the mind and slow down the body. If you revisit these routines at approximately the same time each night, you will begin to know when it’s time for sleep. Going to bed at approximately the same time every night and waking up at approximately the same time every morning will lead to a much more restful and productive life. Of course, this one can seem impossible, but also remember that life is flexible. You can still have some late nights, vacations away, early mornings and unfamiliar sleep situations. What’s important is to remain mindful and take the attempt to get to bed within a 2-3 hour range to prevent overtiredness or restless nights down the road. 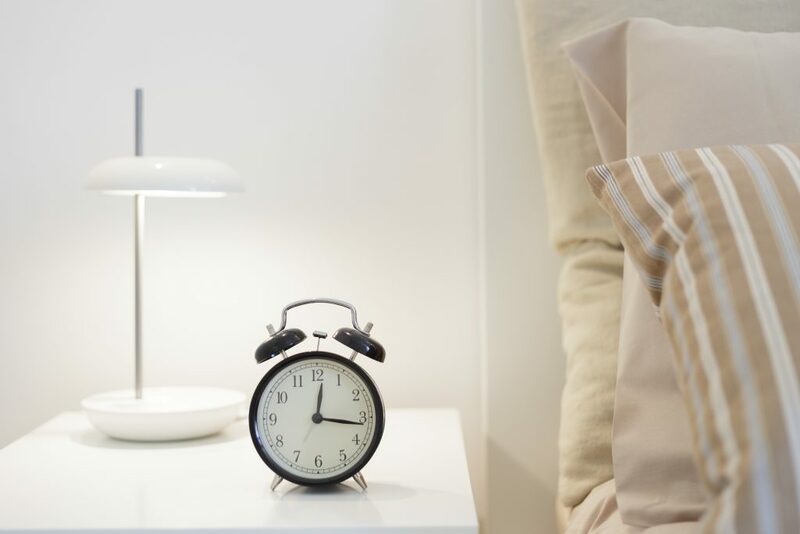 Once you master this tip, you may never need another alarm clock again! It’s an age-old debate – is it better to have your bedroom hot or cold at night? Should we sleep with the air-conditioner on all night or just quickly cool down the room before bed? Temperatures over 24°C (71°F) are likely to cause restlessness, while a cold room of about 12°C (53°F) will make it difficult to drop off. Make sure your bedroom is set up to be the perfect sleep environment. This is likely the easiest tip to implement – although it could involve some expense. Your bedroom essentials play a huge part in terms of comfort which in turn can greatly improve sleep quality. Consider bedding that breathes (crisp sheets) and be sure to wash and replace them regularly. Bedding collects allergens and dust that can complicate your breathing and sneezing while you doze. Invest in a supportive pillow that you can also easily wash. If your mattress is overworn, lumpy and no longer flat to the eye, it may be time for an upgrade – consider a foam mattress. These inventive beds offer unparalleled support and stay cooler; less heat retention will lead to easier sleep.